Building codes, mantels, MDF, toenailing, welding, heating options, and gift ideas at the Taunton Store. In this episode, Justin, Brian, and Rob return to offer some Happy Thanksgiving wishes. Not to get too far into the weeds on how the podcast sausage is made, if you’ll forgive the mixed metaphor, but we usually record these a couple weeks before they air, so if the timing is off, we end up not exactly sure when a given episode will be released. Well this time we nailed it! Thanksgiving podcast, released on Black Friday! Happy Turkey Day, everybody. Personally, I’m thankful we got this one scheduled just right. Brian and Justin have been thinking about mantels for an upcoming magazine article. The two guys worked in Justin’s home shop, which he recently upgraded with better storage and organization. By the way, if you are wondering if the right word is “mantel” or “mantle,” the answer is mantel, with an -el at the end. 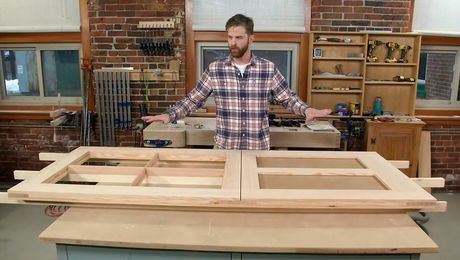 The guys are not as worried about the rules of grammar as your show notes compiler is, but on the other hand, they do care a lot about the rules of building codes for mantels, which they talk a lot about on the show. Justin has a good deal of real-world experience making mantels, so there’s some excellent detail here. Rob offers an update on his attic renovation project. He has just one more weekend’s worth of work to get the framing done. 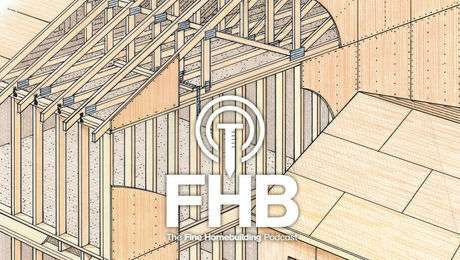 The guys also discuss dry lumber and splitting, making metal handrails, and built-ins. The show starts to wind down as the guys get their “ducts in a row” and talk about hockey movies. But there’s still time for a listener question on electric radiant panels. Common in Europe, less so in the States, turns out Brian had some in his house once. Then the guys return to the question of using (maybe drinking) water from the dehumidifier. Finally, tile and shower specialist Martin has better advice than the guys gave in a previous show. Also, we have another special offer for podcast listeners Use coupon code GIFT20 at the Taunton Online Store. We have tons of home construction and remodeling gift ideas over there, electronic and print, for you or for your friends and loved ones. 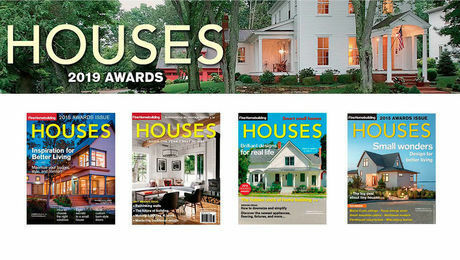 You may even find some ideas for the people in your life who love cooking, gardening, and sewing. You might think about gaming the system — I know I did — by taking the special subscription offer and then getting another 20% off that. Sorry, no dice. 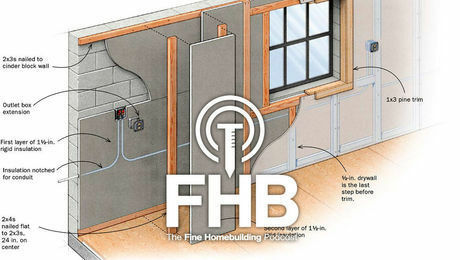 If you go to the Taunton Store, and you apply the 20% discount, you get the exact same prices as if you go to finehomebuilding.com/podoffer. It’s still a great deal, though, both ways. Mario’s book mentioned in the podcast, on sale at Amazon. Federal Fireplace Mantel at Fine Woodworking. FWW Members Only: A Mantel with a Mission. FWW Members Only: Build a Fireplace Mantel. 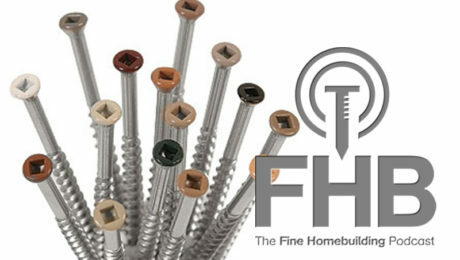 FHB Members Only: Metalwork for Builders. Video: Welding 101: Fabricating a Steel Handrail. Slide Show: Men of Steel. Like Justin says in this podcast, #KeepCraftAlive tee-shirts make great gifts, and the proceeds support scholarships for building trades students. So go order some shirts at KeepCraftAlive.org. What is the point of a video of three guys talking for an hour? I clicked through the video about 20 times looking for pictures or videos of something other than Justin, Brian, and Rob talking. Nothing. This is a waste of video if there is nothing to see. A transcript with sections labeled would be much more useful than having to listen to the whole hour or sitting in a chair watching the whole hour. Another to make this more user friendly. How about an index with topic and starting time so someone can pick out only what they want to hear or maybe see?